The National Institutes of Health and Harvard University have paired up for a study on the effects of animal fat consumption and gestational diabetes. According to the study results, pregnant women who consumed diets high in animal cholesterol and fat were more likely to suffer gestational diabetes than women who consumed less of the two. Gestational diabetes is a condition present only during pregnancy. The risks to baby and the pregnant woman include greater chance of complications and fetal/infant health issues. Hidden among the results of the study were findings the researchers didn’t expect. When women who consumed diets high in animal cholesterol and fat chose other lifestyle changes typically associated with lowering the risk of gestational diabetes, the changes were no longer effective at reducing diabetes risk. For instance, women consuming diets high in animal fat and cholesterol who exercise daily still carried a higher risk of gestational diabetes despite the association between exercise and lowered diabetes risk during pregnancy. Pregnant women do have options to reduce their risk, however. According to the senior author of the study, “Our findings indicate that women who reduce the proportion of animal fat and cholesterol in their diets before pregnancy may lower their risk for gestational diabetes during pregnancy.” All it takes is a 5-percent change in dietary calories from animal sources to plant sources to make a significant impact on diabetes risk. If a pregnant women is consuming 2,000 calories a day, that is a change of just 100 calories to plant-based fats. The firststudywas completed by researchers at Harvard University. Researchers used a former study to investigate more than 12,000 health records. The women in the study ranged in age from 22 to 45. Women were followed for multiple years with reports collected every two years on general health, pregnancy status and lifestyle. Every four years, women were asked to complete a more detailed questionnaire on food intake. 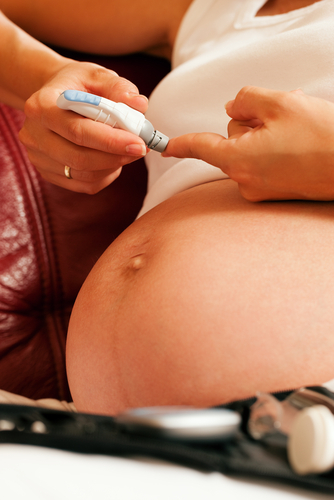 During pregnancy, about 6-percent of participants reported suffering gestational diabetes. When dietary intake was analyzed, increased intake of animal cholesterol and fat was associated with increased risk of diabetes. Source: K Bowers, DK Tobias, E Yeung, FB Hu, C Zhang. American Journal of Clinical Nutrition. 25 January, 2012.